Designed for use with DJI drones, the Zenmuse X5 cameras have 16-million pixel Four Thirds sensors and are compatible with Micro Four Thirds System lenses. 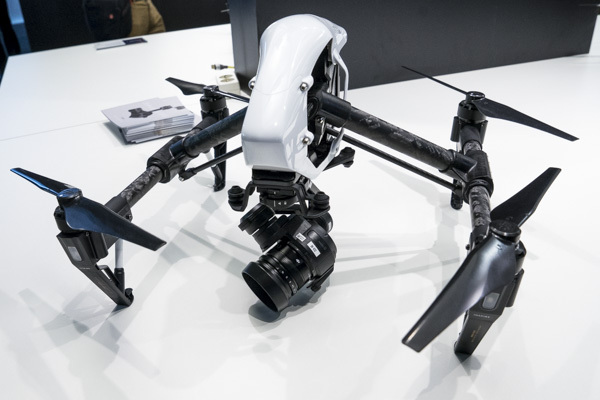 In one of the surprise announcements of IBC, Chinese manufacturer DJI launched a pair of cameras designed for the companies aerial drones. At the core of the cameras is a 16-million-pixel Four Thirds sensor and a Micro Four Thirds lens mount. DJI claim that the sensor can capture footage with a dynamic range of 12.8EV, which is impressive given the fact that these cameras are designed for use with the Inspire 1 drone. In fact the quality offered by the camera may negate the need to use larger drones for dedicated video cameras. Both camera also feature a built-in 3-axis gimbal, to keep footage smooth and stable. The Zenmuse X5 cameras can not only shoot 1080p (1920 x 1080) footage at up to 60fps, but it can also record 2.7K (2704×1520) video at up to 30 fps, but the clincher is that it is possible to record UHD (3840 x 2160) 25/30fps and 4K (4096×2160) at 24/25 fps in MP4/MOV format. Whilst both cameras can save footage to MicroSD cards up to 64GB in size, but the Zenmuse X5R has a few tricks up its sleeve. The X5R camera can record lossless raw 4K video, which is very impressive given its size. Obviously video of this resolution and quality is going to require very fast processing and record, and with a data rate of an average of 1.7 Gbps, and 2.4Gbps maximum, footage can be saved to a removable SSD with a 512Gb capacity. As standard the Zenmuse X5 lenses come with a DJI branded 15mm f/1.7 lens, but the Panasonic Lumix G Leica DG Summilux ASPH 15mm f/1.7 lens and Olympus M.Zuiko Digital ED 12mm f/2 are also currently compatible with the camera. DJI expect more MFT lenses to be officially supported by the Zenmuse X5 cameras in time, but there was no word on the suitability of other lenses, presumably size and weigh are all a factor for both stable flying and compatibility with the gimbal. 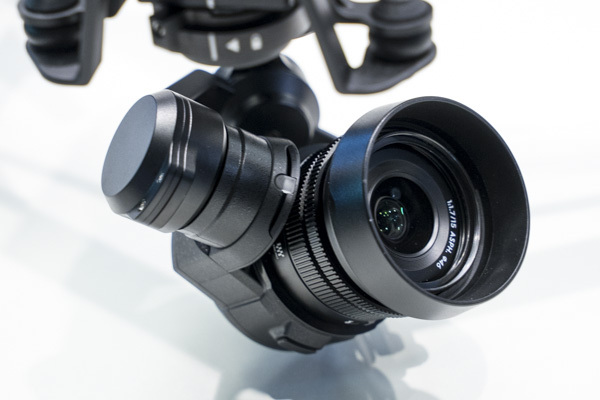 The ZenMuse X5 with DJI 15mm f/1.7 lens will cost £1829, or it is available without a lens for £1399. There is no word yet on the price or availability of the X5R.